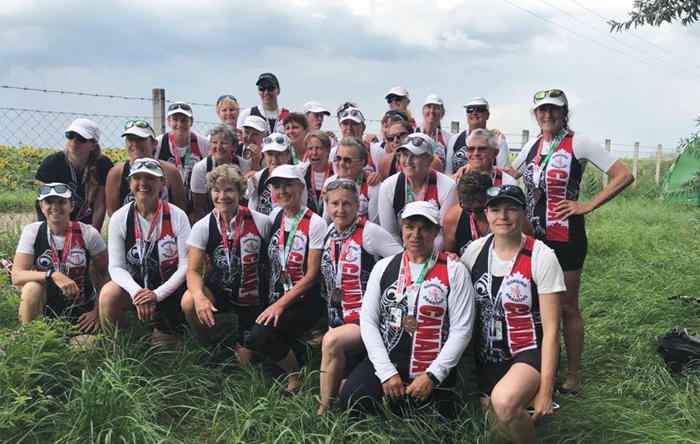 Multi-medal-winning Vancouver Island Gorging Dragons team, of which Salt Spring's Sabine Georgy is a member. A Salt Spring Island paddler can add “world champion” to her accomplishments after this year’s Club Crew World Championship Dragon Boat racing event in Szeged, Hungary. Sabine Georgy, 60, raced on two teams at the event, competing in the Senior B and C categories. The Senior B team, which is for ages 50-59, placed third in the 200- and 2,000-metre races, as well as gold in the 500-m race. The Senior C Team is for ages 60-69 and they placed bronze in the 200-m, silver in the 500-m and fourth place in the 2,000-m events. Racers are allowed to paddle in younger age groups, so Georgy was able to compete in multiple events. The event was Georgy’s first time competing at the highest level. At the event, 140 teams from 30 different countries were in attendance, with around 6,000 paddlers braving the hot and humid weather in Szeged. Georgy started dragon boat racing with Salt Spring’s Spirit Point Dragons. After about six years with the local team, Georgy sought a higher level of competition and began training with the Gorging Dragons in Victoria. For more on this story, see the August 1, 2018 issue of the Gulf Islands Driftwood newspaper, or subscribe online.